CAMPLE LINE is delighted to be screening these two wonderful films, by Dryden Goodwin and SallaTykkä respectively, on the hour from 11am till 4pm on Saturday 22 July. Last screening begins at 3pm. 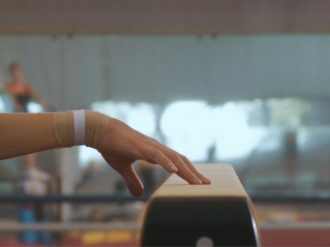 Salla Tykkä’s film Giant (2014) takes us to boarding schools in Onest and Deva in Romania, and features a group of young girls training to become top gymnasts. Tykkä combines images of the girls training with clips of empty gymnasiums, footage from the 1970s and 80s, and excerpts of interviews with the young gymnasts discussing their memories, fears and dreams. Dryden Goodwin’s film explores the physical and emotional dynamics of a group of young female divers. Portraying the girls on their own, interacting with each other, and under the gaze of their coaches as they prepare for a dive, Goodwin’s camera combines extreme close-up with oblique detail to illuminate the ways they maintain their intensity of focus as they seek to perfect their dives.